There is a new ColdFusion Builder, right? After speaking to a few other people in the community, it seems like there is a bit of confusion about the update to ColdFusion Builder. We (Adobe) can probably do a better job on the web site making this clear, but in the interim, let’s clear up a few things. 1) The latest version of ColdFusion Builder is 2.0.1. The last main release was 2.0, and we had an updater after that. 2) If you go to the web site, you only see “2” mentioned. I think that’s probably fair, but, again, it may not be obvious to existing users. I thought you had to uninstall the previous version, but Charlie Arehart let me know that you do not need to do this. The installer will recognize the previous install and upgrade it. 4) So what’s new? Lots of cool stuff. Here is a link to the docs pages for new features in 2.0.1. Extensions got a lot of love in 2.0.1! 5) Hey - you can still run it for free. 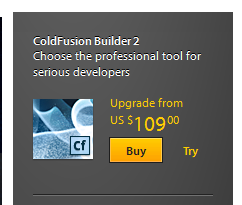 Again, you can run ColdFusion Builder for free. I know I keep saying this, but people forget it. Yes, it is a “reduced functionality” version, but if you need more time to determine if you want to purchase the tool (and we give you 60 days! ), then you can continue using the product past the trial period.